Hi everyone! Welcome to this month’s Birthday Project Challenge! Most of the supplies I used for this project are linked in the link-up tool at the bottom of this post. For this card, I used several stamp sets. The dog is from the Birdie Brown Best in Show stamp set. Awww… he is a Papillon dog and I colored him like my sweet little Max (for those who know him from Instagram). I’m so happy to have a Papillon dog stamp now! 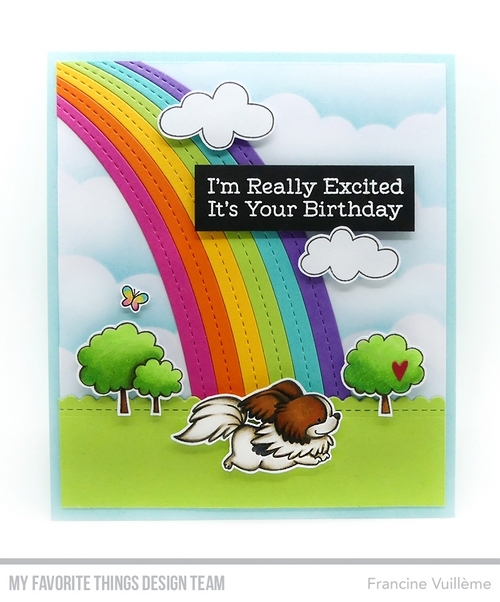 The sentiment is from the Puppy Pals set and was heat embossed onto Black Licorice cardstock using white embossing powder. The clouds are from the Purrfect Friends set. The trees and the butterfly are from the Just Duck stamp set. The rainbow is from the End of the Rainbow Die-namics set. 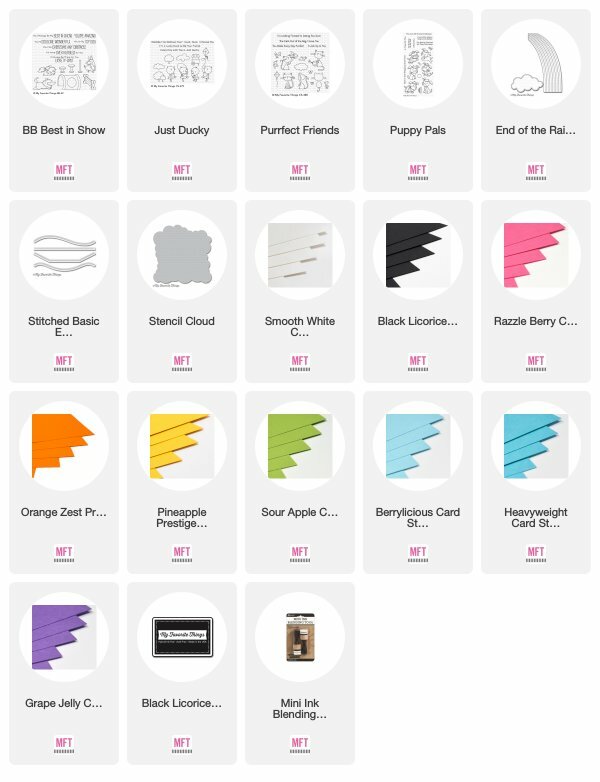 I used MFT cardstock: Razzle Berry, Orange Zest, Pineapple, Sour Apple, Blu Raspberry and Grape Jelly. The background sky was sponged using Distress inks and the Cloud stencil. The grassy border was die cut from Sour Apple cardstock using the Stitched Scallop Basic Edges 2 Die-namics. I did a top-folded card base using Berrylicious cardstock. 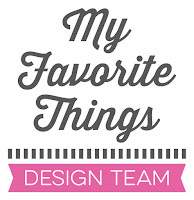 Head over to the MFT Challenge blog for more details if you’d like to play along and to check out what the other design team members have created! That's beautiful! I love the rainbow and that little puppy is adorable. I love your coloring. So cute as usual! I was waiting to see your inspiration with Sweet Little Max. Great Card! Such a cute pup and I LOVE your rainbow! You certainly know how to create a fun scene, Francine!